There is no definitive “inventor” of tennis like there is for some other sports. There is even some debate on what tennis is derived from and how long ago it was first played. The game of tennis is believed to have first been played thousands of years ago. The ancient Egyptians, Greeks and Romans played games that could be considered precursors to tennis, though there are no drawings or descriptions of any tennis-like games. Romans playing a ball game that may have been the start of tennis. Several examples of words from ancient languages could be the root of modern tennis terms. The Arabic word rahat means the palm of the hand which is similar to the word racquet and the Egyptian town Tinnis is similar to the word tennis. Egyptians playing a ball game that may have been the start of tennis. This suggests that the Egyptians may have played a form of tennis. 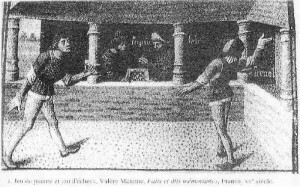 More substantial evidence suggests that tennis derived from a game called “Jeu de Paume” (game of the palm) which was first played by French monks in the 11th or 12th century. French monks playing Jeu de Paume. Over the next few centuries the game continued to grow in popularity. Tennis spread beyond the monastery walls and started being played by the nobility throughout much of Europe. By the 13th century there were as many as 1,800 indoor courts within France alone. With the games popularity increasing, controversy started to arise with several members of the Church, including the Pope, as well as King Louis IV, trying to ban the game. There efforts proved fruitless and the game kept flourishing. The game quickly spread across the seas to England. Both Kings Henry VII and Henry VIII began playing the game. King Henry VIII commissioned the building of many courts across England. The one built in Hampton Court Palace in 1625 survives to this day. The more popular tennis became, the more it also evolved. Courtyard playing areas began to be modified into indoor courts, and the balls, which were initially wooden, gave way to bouncier, leather balls filled with cellulose material. In its infancy it was played using the hand, but over time people began wearing a glove, either with webbing between the fingers or a solid paddle, and eventually a webbing attached to a handle – a forerunner to the racket. By 1500, a wooden frame racquet laced with sheep gut was in common use, together with a cork ball weighing approximately three ounces. However, despite all this innovation, the game of ‘court’ or ‘real’ tennis, as it is referred to today, was incredibly different to the global sport we now know as tennis. Games took place in narrow, indoor courts, where the ball was played off walls with rooved galleries and a number of openings. Players won points by hitting the ball into netted windows beneath the rooves, with the net being five feet high on the ends and three feet in the middle, which created a pronounced droop. The game’s popularity dwindled during the 1700s, but experienced another revolution in 1850: Charles Goodyear invented a process for rubber called vulcanisation, which made the material used to make tennis balls significantly bouncier. As a result, tennis could now be played outdoors on grass. The foundations for modern tennis had been paved. The officially recognized centennial of the game in 1973 commemorated its introduction by Major Walter Clopton Wingfield in 1873. He published the first book of rules that year and took out a patent on his game in 1874, although historians have concluded that similar games were played earlier and that the first tennis club was established by the Englishman Harry Gem and several associates in Leamington in 1872. 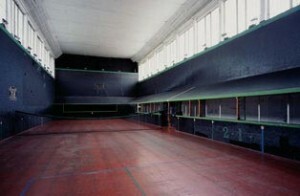 Wingfield’s court was of the hourglass shape and may have developed from badminton. 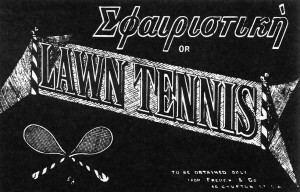 The hourglass shape, stipulated by Wingfield in his booklet “Sphairistiké, or Lawn Tennis,” may have been adopted for patent reasons since it distinguished the court from ordinary rectangular courts. At the time, the Marylebone Cricket Club (MCC) was the governing body of real tennis, whose rules it had recently revised. After J.M. Heathcote, a distinguished real tennis player, developed a better tennis ball of rubber covered with white flannel, the MCC in 1875 established a new, standardized set of rules for tennis. Tennis derived from a game called Jeu de Paume (game of the palm) first played by French monks in the 11th or 12th century, and the first racquets were not racquets at all as they used the palm of their hands to strike the ball. Jeu de Paume in action! This early version of tennis was more like handball. First they played by hitting against a wall, but soon they started playing over a net. Hitting the ball with the bare hand often would cause bruised and swollen hands, broken fingers and torn nails so players began using a glove-like covering to protect the hand. These gloves did have several disadvantage for the player. One, the glove proved to be tiresome to wear. It also gave the player less feel, touch and finesse then using a bare hand. Eventually players started to modify the gloves to try and gain a competitive advantage. Some players used webbing between the fingers while others started to use a wooden paddle called a battoir instead of a glove. By the 14th century, Italian players had begun using a real racquet. These racquets were very similar in design to the racquets we use today. The frame of the racquet was wooden and the head of the racquet had strings generally composed of gut. Jeu de Paume being played with racquets. 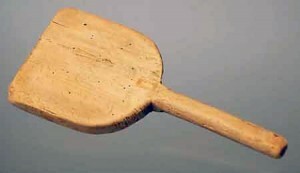 The Arabic ‘rahat al-yad ’ means ‘palm of the hand’ or ‘palm-shaped’: it’s believed that this provides the etymological root of the term ‘racket’ or ‘racquet’ (this said, others argue that the racket was invented in the Low Countries and that its name comes from the Dutch verb ‘raecke’ – to hit or strike). Initially there were many shapes and stringing methods but eventually the racquet started to take on some uniform properties. The early racquets had a long handle and a small, teardrop-shaped head. The racquets head shape was also lopsided. This made it look more like a hand. 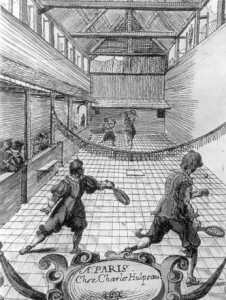 By the late 1500’s, racquets were in widespread use. A racquet with long handle and tear drop shaped head. In 1874, Major Walter C. Wingfield registered his patent in London for the equipment and rules of an outdoor lawn tennis that is generally considered the first version the game we call tennis today. Picture of original 1874 rule book. Within a year, Wingfield’s equipment sets had been sold for use in Russia, India, Canada, and China. The racquets had changed slightly over the last few hundred years with the head having grown to the standard size everyone is accustom to seeing. The shape wasn’t quite as oval as most modern wooden racquets. The head was quite a bit wider and flatter toward the top. 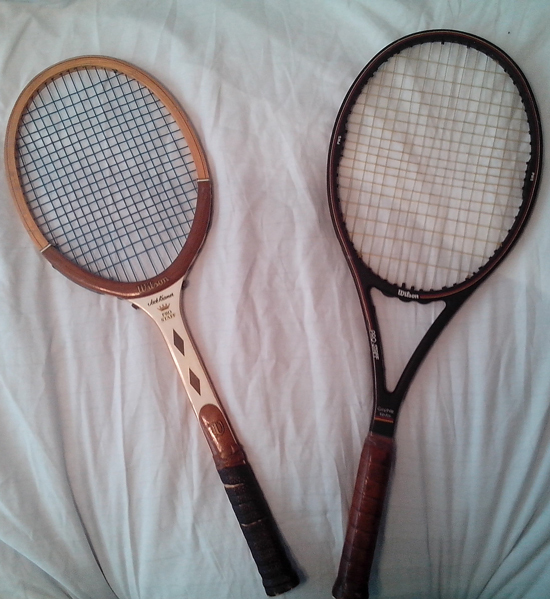 1800’s racquet vs more modern racquet. Racquets saw only minor changes in there appearance between 1874 and the end of the wooden racquet era more than 100 years later. Wooden racquets did become quite a bit more technologically advanced over those 100 years even though there appearance didn’t change much. Improvements in laminating technology (using thin layers of wood glued together), but they remained heavy (13-14 ounces), with small heads (around 65 square inches). Compared to the contemporary racquet, even the best wood racquets were cumbersome and lacking in power. An alternative to wooden racquets first showed up in the late 1800’s. A racquet with a metal head existed as early as 1889, but it never saw widespread use. 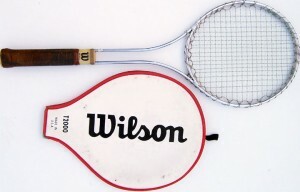 Wood’s use as a frame material didn’t undergo any real challenge until 1967, when Wilson Sporting Goods introduced the first popular metal racquet, the T2000. The popular Wilson T 2000. Stronger and lighter than wood, it became a top seller, and Jimmy Connors became its most famous user, playing at the top of men’s professional tennis for much of the 1970’s using the long-throated, small-headed steel frame. 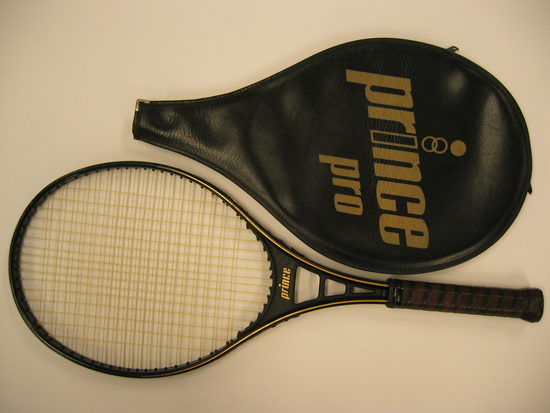 In 1976, Howard Head, then working with the Prince brand, introduced the first oversized racquet to gain widespread popularity, the Prince Classic. The first popular oversize racquet – the Prince Classic! The Prince Classic and its more expensive cousin, the Prince Pro, were top sellers. Both had aluminum frames and a string area more than 50 percent larger than the standard 65 square inch wood racquet. The more expensive Prince Pro racquet. The light weight, huge sweet spot, and greatly increased power of these first oversized racquets made tennis much easier for non-advanced players. For powerful, more advanced players, the mixture of flexibility and power in the frames resulted in too much unpredictability in where the ball would end up. Hard, off-center shots would momentarily distort the aluminum frame, changing the direction in which the string plane was facing, and the lively string bed would then send the ball rocketing off in a somewhat unintended direction. Advanced players needed a stiffer frame material, and the best material proved to be a mixture of carbon fibers and a plastic resin to bind them together. This new material acquired the name “graphite,” even though it isn’t true graphite such as you would find in a pencil or in lock lubricant. The hallmark of a good racquet quickly became graphite construction. Out with the old in with the new – Wooden Pro Staff to Graphite Pro Staff. By 1980, racquets could pretty much be divided into two classes: inexpensive racquets made of aluminum and expensive ones made of graphite or a composite. Wood no longer offered anything that another material couldn’t provide better — except for antique and collectible value. The two key properties for a racquet material are stiffness and weight. Graphite remains the most common choice for stiff racquets, and the technology for adding stiffness without adding weight continues to improve. 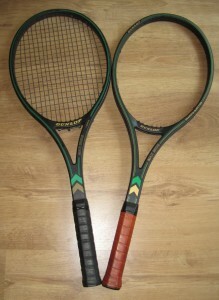 One of the most famous of the early graphite racquets was the Dunlop Max 200G, used by both John McEnroe and Steffi Graf. Its weight in 1980 was 12.5 ounces. Over the 20 years since, average racquet weights have decreased to around 10.5 ounces, with some racquets as light as 7 ounces. New materials such as ceramics, fiberglass, boron, titanium, Kevlar, and Twaron are constantly being tried, almost always in a mix with graphite. The first widebody racquet – the Wilson Profile. In retrospect, it seems strange that no one thought of the idea sooner to increase the thickness of the frame along the direction in which it must resist the impact of the ball. The Profile was a monster of a racquet, with a frame 39 mm wide at the middle of its tapered head, more than twice the width of the classic wooden frame. By the mid 1990’s, such extreme widths had fallen out of favor, but the widebody innovation carries forward: most frames sold today are wider than the pre-widebody standard. The racquet makers have, to some extent, suffered from their own success. Unlike wood racquets, which warped, cracked, and dried out with age, graphite racquets can last for many years without a noticeable loss of performance. A 10-year-old graphite racquet can be so good and so durable that its owner has little motivation to replace it. The racquet companies have met this problem with a stream of innovations, some of which, like the oversized head, wider frame, and lighter weight are evident in almost every racquet made today. Other innovations have been less universal, such as extreme head-heavy balance as seen in the Wilson Hammer racquets, and extra length, first introduced by Dunlop. What’s next? How about an electronic racquet? Head has come out with a racquet that uses piezoelectric technology. Piezoelectric materials convert vibration or motion to and from electrical energy. Head’s new racquet takes the vibration resulting from impact with the ball and converts it to electrical energy, which serves to dampen that vibration. A circuit board in the racquet’s handle then amplifies that electrical energy and sends it back to the piezoelectric ceramic composites in the frame, causing those materials to stiffen. The medieval French monks would be impressed.